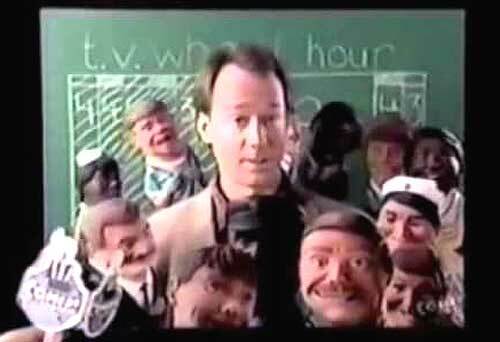 Joel Hodgson and the type of people he works with best. THE TV WHEEL is a large circular studio set with a camera in the middle, able to rotate and capture sketch performances in segments of the circular set. As one sketch is performed in one segment of the set, another segment sets up the props for the next sketch, camera rotating to capture that sketch, and so on. All done in real time. No cuts, no mistakes, no slowing down. And unfortunately, no greenlight. Be careful with that axe, Eugene! 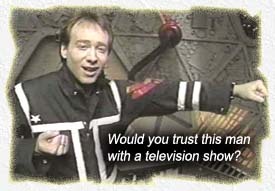 Created by Joel Hodgson (the genius behind MYSTERY SCIENCE THEATER 3000), THE TV WHEEL sadly did not make it past the pilot.When a person is successful at anything (sports, music, writing, or simply making money), they sometimes get lauded as “genius” if they are exceptional at it, or if the manner in which they made their mark was uncommon. Joel Hodgson is a genius – an unassuming, Middle-American Everyman who has a grasp for the uncommon idea and the uncanny ability to assemble a spirited team to put those ideas in motion. Conversely, when a genius hits upon an idea that does not sell, that is not embraced by the executives whose job is to promulgate it – then the genius is unfortunately held in contempt. This does not make the idea any less ingenious. THE TV WHEEL may not be wholly original, but the energy and creativity Joel brought to this simple concept outweighed any kind of composite plagiarism. As with his legendary MYSTERY SCIENCE THEATER 3000, Joel once again combined a wealth of simple ideas into one strong, sellable concept. Unfortunately, the cul-de-sac-minded programmers who run the airwaves thought differently. An aura of desperation pervaded THE TV WHEEL’s cast and sketches, but that was the nature of the beast; this was meant to be a frenetic serving up of old-school theatrics – no pre-taped segments or special effects were going to intrude upon Joel’s vision of everything being performed live in real time. I was shocked and disappointed that THE TV WHEEL did not get even one season to establish itself. One can only imagine the frustration Joel must have experienced as Comedy Central execs shook their heads at his idea, even while they raked in the cash as Joel helmed MST3K to worldwide cult status. Comedy Central aired the pilot (obviously to test the ratings waters) and then definitively axed it. Idiots. We are left watching the skies in anticipation of Genius Joel’s Next Big Thing. Produced by: Joel Hodgson, Javier Winnik. Writers: Judd Apatow, Nick Bakay, Morwenna Banks, Paul Feig, Joel Hodgson, Nell Scovell.